...it might mean that I actually won something at Cousins Day, but no. This was not one of my "winning" months. Of course The Queen Bee (my mother) complained the whole time that she only won two or three--or was it eight?--games, and she had to go get a bigger container to hold all of her winnings, while my piddling little plastic baggie got lighter and lighter. But am I complaining? Noooooo......... I'm a good girl, I am. I suffer in silence. 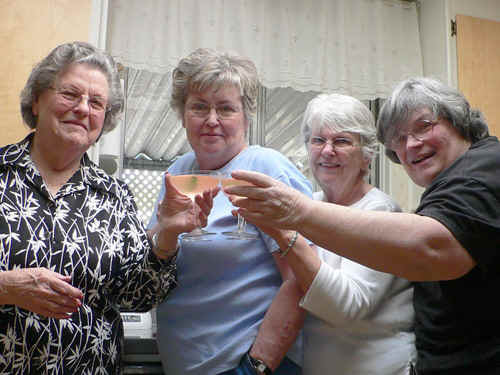 Yes, our "April" Cousins Day took place on May 1. We had actually scheduled it for a week or two earlier, but Kathy was not feeling well, so rather than go ahead without her, we waited till she was feeling better, and of course, that was best. Without any one of us it would just have been a "visit" but having all four of us there made it "Cousins Day." These things have taken on a real routine. Kathy picks up Peach and while they drive here, the two of them rehash the highs and lows since our last time together. Then they get me and I go over my own highs and lows and they repeat what they've already talked over for my benefit. By the time we've gone through the recitation, we are at my mother's. We move our stuff (overnight clothes, books, food, booze, and Kathy's oxygen tanks) into the house, settle in with a cup of coffee and then do the whole thing all over again for my mother's benefit, while she adds her own. By the time we've finished the final sharing, it's time for lunch. This time my mother made a salad with huge shrimp on it (is "huge shrimp" an oxymoron? ), along with crackers and grapes and then, as we began to slow our eating, the leaped up to grab her pencil to sharpen it, Peach cleared away the plates, I moved the placemats and Kathy started shuffling the cards. The "65" marathon had begun again. As I said, this was not my month. Last month I did surprisingly well, but I lost every game this time around. 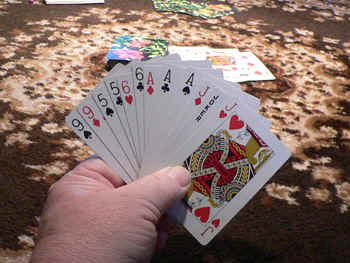 It costs $1.15 to play each game, which consists of 11 hands, and if you win a hand you get .20. I don't think there was a game that I didn't win at least .20, but at the conclusion of the game, the winner gets whatever is left over and I never won the big pot. However, the purpose of the game is not to win money, it's a great vehicle for conversation, laughs, and serious talk, in addition to complaining about who is cheating, who has won what, and who is angry with whom for discarding the wrong card. At the end of 3 or 4 games, we decided that even though the clock didn't say 5 p.m. yet, it was time for drinks. This was Peach's month and she made something called Moscow Mule, which is some sort of a passionfruit drink mixer, with ginger ale, vodka and slices of fresh ginger and a spring of mint. Very refreshing. Much too easy going down. We had a few of these while we played another game and then retired to the living room to talk again while my dinner baked. I brought an enchilada casserole which was much better tasting than I had expected it to be. I didn't take shortcuts this time, and the real "making it from scratch" thing showed in the taste. Fortunately it was much too much for us, so I brought half of it home and will have it for dinner tonight. After dinner there was another game of cards, but Kathy hit the wall and we called it a night in time to watch "Survivor" and "CSI." My mother watched "Without a Trace" and I was going to watch it with her (Peach and Kathy had retreated to their respective beds), but I got under a blanket, took off my glasses and wasn't aware of anything from about 2 minutes later until I heard Kathy moving around in the family room around 6 a.m. It turned out poor Kath had a bad night, and spent most of it draped over the toilet in the bathroom. Not too much booze. I talk a good game, but we don't really drink that much and the drinks are usually more mix than actual booze. But she didn't sleep more than maybe an hour all night long. My mother made French toast for breakfast, after which the cards came out yet again and the others had one more chance to humiliate me before we left for home. Expanded version on RSS feed mirror site, linked at left.